White, the spreading lobes have bearded inner surfaces. 3-6 together in spikes. 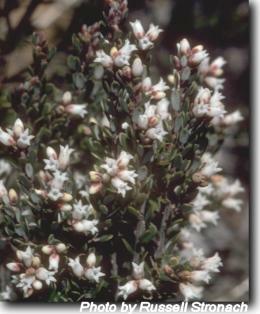 Small shrub, usually erect and much-branched. Locally frequent in upland grassland. Storage of seed in a dark place for 3-6 months may promote germination. Sow in media inoculated with soil from around parent plant. Keep trays in partial shade. Stratification may reduce germination time. Bird-ingested seed has provided some good results. Usually grown from cuttings of barely firm young growth (which is rarely available).The percentage strike is generally low and the roots that are formed are very fine and easily damaged in repotting operations. Not easily maintained. It is suggested that most species require a well-drained, well-composted soil with cool root run of large flat stones or a thick mulch. Some shade is also considered beneficial. More experimental work is needed.